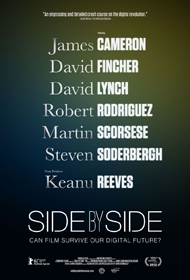 FILM kicks off fall season with ?Side By Side? It sounds similar to the argument being had over the best method of listening to or experiencing music. Vinyl provides warmth that CDs and MP3s fail to capture. But plugging a turntable into your car's dash seems laughable – but even less laughable than going for a run through the park with one strapped to your back. But there's a magic to be had in an older technology – the scraping of the needle as it meets the vinyl and settles into a groove, the sound of crackling as it takes us back to the days before 8-tracks and cassette tapes – that keeps the debate raging. Chris Kenneally's "Side By Side" follows a similar argument being had in the film industry, as he frames the debate between photochemical filmmaking and digital filmmaking. Through the documentary, Kenneally tracks the evolution of the art of film beginning in 1825 through present day, as filmmakers wrestle to determine the best means of capturing their vision for audiences to see. With Keanu Reeves at the helm of the film as narrator and interviewer, Kenneally peppers the documentary with insight from actors, directors, cinematographers, editors, film executives, special-effects artists, and more in what results in a sheer cinephilic delight of the amalgamation of the art and science of the silver screen. Reeves, who also produced the film, displays keen insight not just into the film industry, but the production that takes place behind the scenes that many viewers likely took for granted – before this film, at least. In between the filming for various other projects, Reeves sits down to pick the minds of film greats, like Christopher Nolan and Martin Scorsese – both of whom relish the qualities celluloid offers to cinema – and David Lynch and Steven Soderbergh – both of whom embrace the advances in filming that digital technologies brings – as well as James Cameron and George Lucas, who stand at the forefront, pushing and demanding more of the medium than ever before. All of which continually kindles the fire burning between the two sides. The film opens with a montage of notable and respected films, both classic and contemporary, and Kenneally refuses to let his foot off the gas, keeping the momentum rolling. Amid the interviews, Kenneally packs the interesting and relevant – albeit dense at times – science behind the processes, where we learn tidbits, like how silver filaments react to capture images and how high-definition cameras offer 1920 pixels per frame and the invention of the RED Camera multiples that to 4096 and the RED Epic takes it even further to 5120. We also witness the evolution of filmmaking, ranging from abandoning large production equipment for handheld devices to the recent employment of 3D cameras as the technological tides of the art of film ebb and flow. While the jargon at times can seem heady, the film covers the technical aspects well enough without losing the argument of the art of film – which is what all of this boils down to – and at the focal point, Kenneally keys on the industry heavyweights to keep the argument in perspective. Both methods have pros, but they also have cons, and Kenneally and Reeves present each side fairly, allowing the experts to do the arguing and allowing the viewer to choose their side as they delight in the evolution of the art and science of film, which results in a triumphant rendering of the filmmaking process that any movie-goer can appreciate. FILM at the Erie Art Musem presents "Side By Side" at 8 p.m., Wednesday, Oct. 3, with doors opening at 7 p.m.
Curator of the series and local filmmaker John C. Lyons said that he chose the film because of its timely content and that it provides a great look into the filmmaking process while remaining accessible to anyone with an interesting in film. Lyons added, "What better way to get things started this fall than with a new documentary tackling the film versus digital debate head-on and featuring today's top filmmakers. Both entertaining and educational, film fans are in for a real treat. I look forward to hearing our own debates once the lights come up." For more information on FILM at the Erie Art Museum, visit the group's Facebook page.